Akshay Kumar and Rajinikanth starrer ‘2.0’ is the most-anticipated movie of the year. Just two days are left for the release of the trailer which will be out on November 3 and the makers are treating their fans with BTS videos and new posters. Today they have revealed two posters where we can see Rajinikanth as Chitti the Robot and Akshay Kumar as the antagonist. 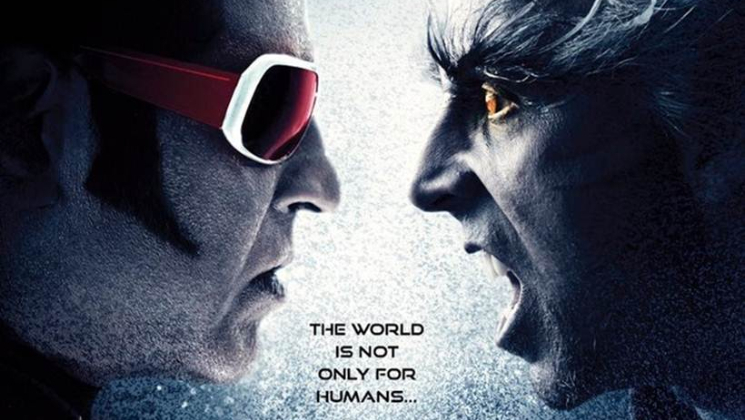 In the poster, Rajinikanth as Chitti looks ferocious in his armour and looks like he is ready to attack the villains. This poster has once again doubled our excitement for the film. Akshay Kumar is playing the antagonist in the movie and the robot saves the world from the villains. Here are the new posters. It would be a treat for the audiences to see Akshay as the deadliest villain and Rajinikanth as the saviour.‘2.0’ is the most expensive Indian movie to date. It is made on a whopping budget of Rs 500 crore as a lot of VFX works have been done in the movie. Bankrolled by Lyca Productions, ‘2.0’ is directed by S. Shankar and it will be releasing in 15 languages including Tamil, Hindi, Telugu and Malayalam. The movie is a sequel to 2010 blockbuster ‘Robot’ which featured Rajinikanth and Aishwarya Rai Bachchan. ‘2.0’ also features Amy Jackson, Sudhanshu Pandey, Adil Hussain and Riyaz Khan in pivotal roles. The movie is slated to hit the screens on November 29, 2018. We are quite excited and eagerly looking forward to the mega sci-fi movie of the year. What about you? Do share your views and for more updates on ‘2.0’, keep reading our space.